My team has over 20 years of experience in Instagram marketing. I personally have helped over 500 accounts grow and become established on Instagram but as a team, we have helped collectively over 7,000 accounts. 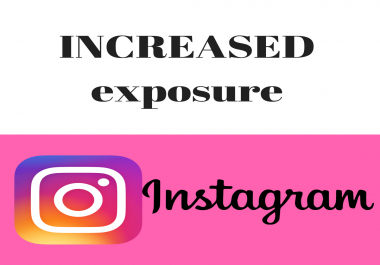 In our service, we will increase your Instagram interaction to get your account noticed by 1000's of new accounts. The increased following will be 100% ORGANIC and earned from a variety of ways but primarily, we will be following (then unfollowing after 2 days), liking photos and commenting on others’ profiles. We only interact with accounts who have shown an interest in similar accounts to yours. This leads to an increase in followers, likes, comments. An increase in brand awareness which can often lead to more sales and more word of mouth advertising. We will target accounts through hashtags, location, influencers/establish brands and competitors. 100% money back guarantee if you do not see growth.